We had a little excitement in the city where I work today. And it paid off to have a digital camera on hand. 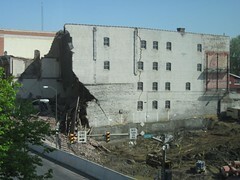 I got a ton of photos from a building collapse that happened across the street where I work. I uploaded a lot to our local NBC affiliate and even has MSNBC Local News pick up one of my photos! It’s my fifteen minutes of fame, I guess. Still, it’s been a pretty crazy day. You can read about the incident here.